Product #60736 | SKU 10-1936 | 0.0 (no ratings yet) Thanks for your rating! 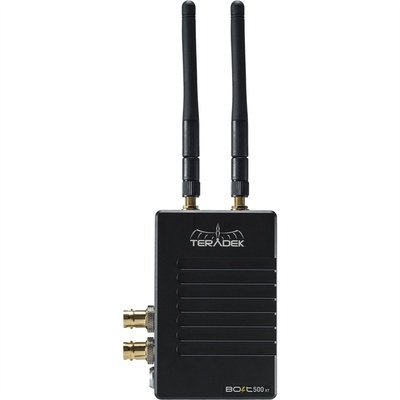 With the Teradek Bolt 500 XT 3G-SDI/HDMI Wireless Transmitter you can transmit visually lossless 3G video signals to a Bolt 500 receiver with zero latency. The Bolt XT is compatible with existing third-generation Bolt systems such as the Bolt 500, 1000, Sidekick II, and 703 Bolt, as well as the Bolt LT. The transmitter unit can be secured to a camera or other SDI/HDMI video source via a built-in 1/4"-20 threaded hole, as well as two M3 threaded holes. The included antennas provide a powerful signal that can travel up to 500' line of sight. A shoe mount is included for attaching to cameras without 1/4"-20 threads. For convenience, both a standard BNC cable and HDMI cable are included so you can plug in right out of the box. Power can be provided using the integrated 2-pin connector via the included D-Tap power cable. The transmitter supports up to four receivers. Built-in AES-128 encryption protects your video from prying eyes, while noise rejection helps keep your video clean even when working around 2.4 and 5.8 GHz signals.